The Cecey Guesthouse is located behind the castle in a quiet suburban area of Eger, close to both the thermal baths and the historic town centre. 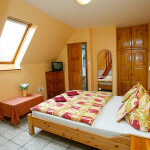 The guesthouse boasts 2 two-room apartment, one of which is also equipped with a well-fitted kitchen and optional spare bed. We can also offer our guests a studio apartment and 5 double rooms with twin beds (and spare bed on request, 4 rooms air conditioning). All are equipped with satellite TV and bathroom with shower and fridge. WiFi internet is available for free! The rooms and apartments are located in separate blocks, about 70 meters far from each other. 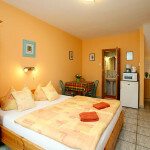 In the Main building, where the 5 double bed rooms are, Guests are welcome to make use of the lounge, terrace and garden. To the apartment belongs only a terrace. Parking is available outside the guesthouse (free) or in the garage. We get the 4-crown, which is the highest classification of the Hungarion Accomodation Association. On the biggest Hungarian booking platform, Szallas.hu we’ve „Excellent” classification.